Lyman Elementary is a Higher Order Thinking (HOT) school that uses the Integrated Day Program in Connecticut. The school serves about 250 students in Kindergarten through Grade Four. The Library Media Center is a hub of activity within the school, sponsoring a variety of integrated learning initiatives, including a MakerSpace to encourage innovation and creativity. Jenny Lussier is the Library Media Specialist for John Lyman Elementary. She is passionate about getting everyone having fun reading and using technology! She is an avid reader personally and is also active on social media, sharing her teaching, reading, and learning tips. Mrs. Lussier introduced Tales2go at school first, for about two weeks. Starting with her oldest students (3rd and 4th grade), and then working with the younger students (1st, 2nd grades and Kindergarten). 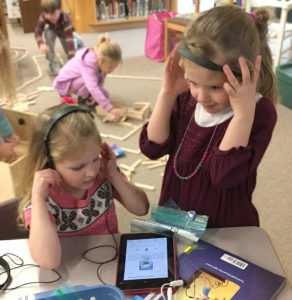 She has ten iPads in her library, so her students use headphone splitters to listen together. Mrs. Lussier explains that reading is a social activity, and her students definitely love doing it together. Tales2go is helping students who want to read the same books as their peers, but struggle to do so independently. Listening to the audio gives those students another access point. Similarly, Kindergarten students who aren’t reading independently yet can use Tales2go to find and listen to books they love. She also helps by making sure that Tales2go is always mentioned as an option during book checkout, as a companion to library books, building or any other activity! She often sees her students listening while building with PlusPlus blocks. Students at Lyman Elementary have found that listening to stories has been a natural addition to their daily activities. 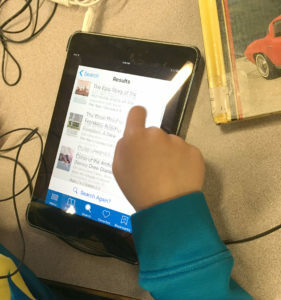 They love to hear Mrs. Lussier highlight titles and authors she finds on Tales2go and then searching for new stories on their own. Students and teachers love how easy it is to use Tales2go. They find new stories in many different ways (browsing by age, grade, series/character, searching). Students are drawn to the large catalog and kept interested because the offerings continue to grow! Learn why Berkeley Unified School District started using Tales2go as a pilot and ended up with a full district adopt at the Elementary level.